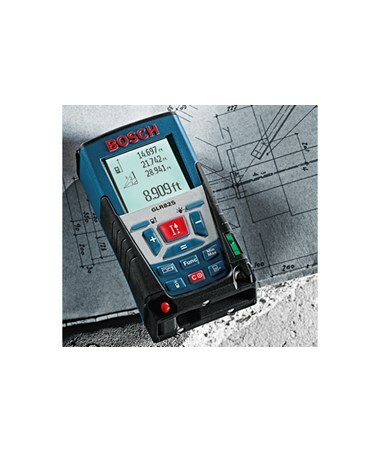 The Bosch GLR825 introduces a whole new level of single-person digital measuring for long-range distances. The laser distance meter exhibits an array of convenient applications and useful features. 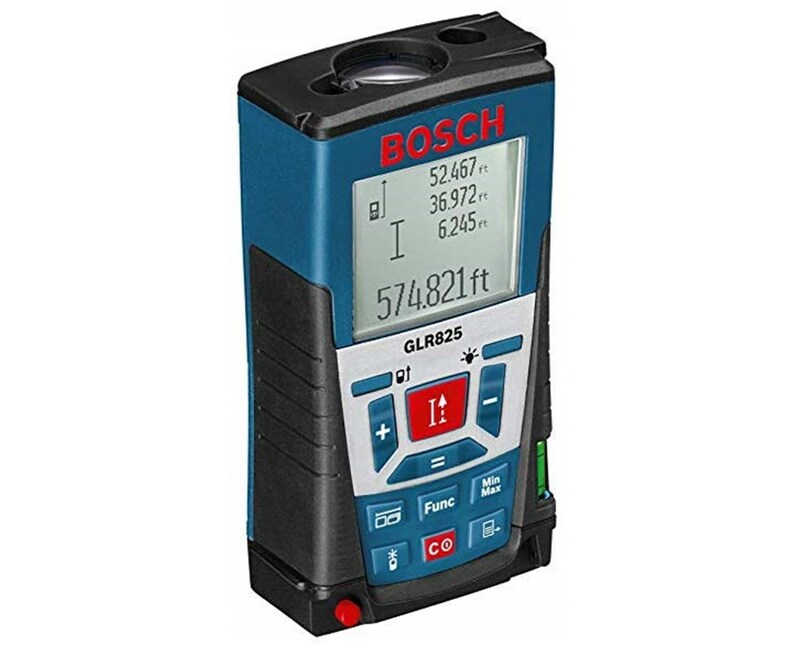 Ranked as the longest distance measurer in its class, the Bosch GLR825 measures distances up to 825 feet and is accurate within ±1/25 inch. The values are clearly presented on the large, illuminated 4-line LCD display. With storage memory that holds up to 30 measurements, you won’t be needing that pen and paper anymore. 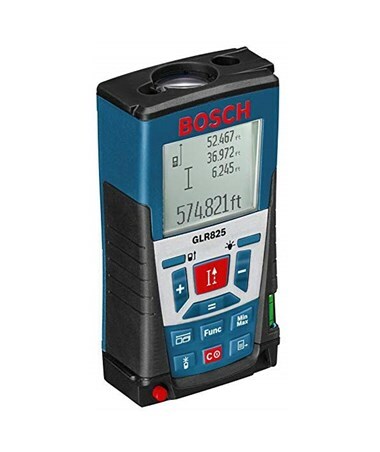 Boasting 11 measuring modes, the Bosch GLR825 laser distance measurer has much to offer professionals working in many fields, such as contracting, plumbing, and painting. Continuous measuring allows the user to move while taking measurements and the min/max function determines the shortest or longest distance from a fixed reference point. Indirect length measurement, including double and combined indirect, uses the Pythagorean method to determine distances that are inaccessible due to obstructions. Calculating area and volume, as well as taking a trapezoid measurement, is simple and quick. The multi-surface area mode is helpful in determining the sum of individual surfaces with a common height, and the stake-out function works to set up pre-determined distances. The handy timer delay can be set anywhere between 0 and 60 seconds to automatically measure any distance. 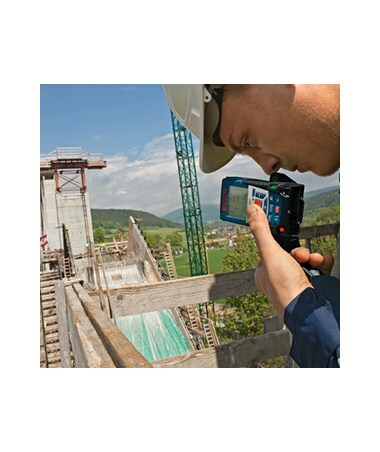 Aside from the abundance of internal capabilities, the Bosch GLR825 digital laser measurer is also comprised of many useful features on the instrument itself. The fold-out metal extension pin allows for precise measuring from corners. The tripod thread enables the device to be screwed onto a tripod, increasing steadiness and accuracy when measuring long distances. There is also a built-in bubble vial, providing visual reference when measuring horizontal distances. 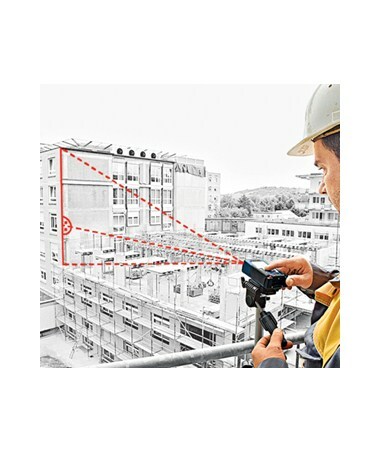 The hand distance meter features a 1.6x magnification viewfinder for easy sighting of the laser dot when it can no longer be seen with the naked eye. 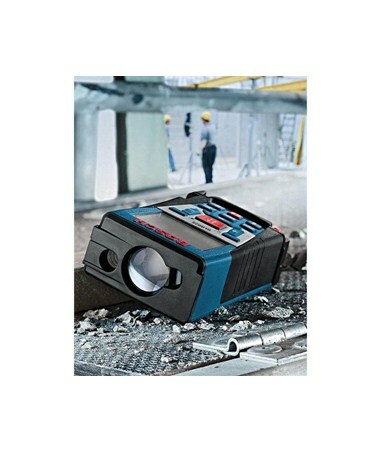 Adding to the laser measurer’s efficiency, the GLR825 takes up to 30,000 measurements on just 4 AAA batteries. The instrument automatically shuts down after 5 minutes and the laser turns off after 20 seconds. The device is extremely durable with its IP54 rating and protection from potential water and dust damage. Weighing just over half a pound, the digital distance meter is extremely lightweight and portable. Backed by a 3-year limited manufacturer’s warranty and 30-day money back return policy, you are sure to be satisfied with both Bosch’s quality and service. Measuring Units m, ft, ft-in., in.